Note: This guide was created from spring of 2002 until 10/16/02 and may contain errors, omissions, etc. If you find an error or think I should add in an animal I have neglected, please contact me. 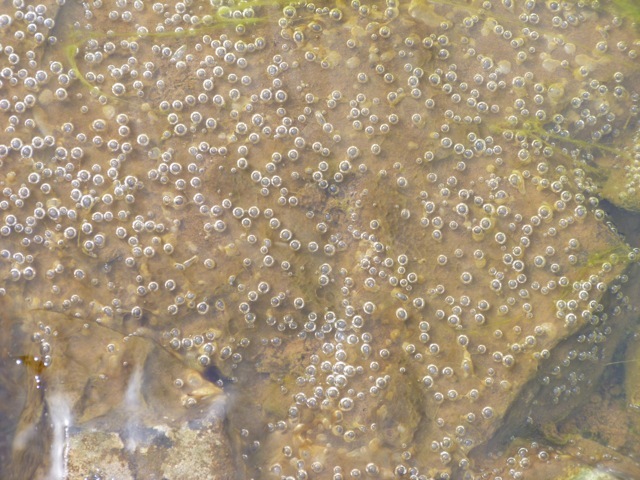 Wood frog eggs, as found, in my dirty 50 gallon tub pond on 3/23/03. 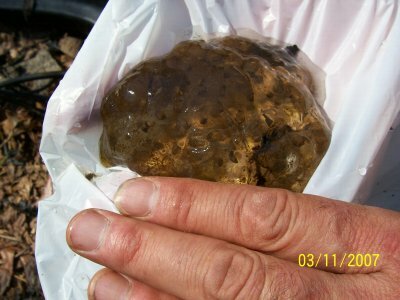 For more on the story and more wood frog egg photos, see my page on wood frogs. 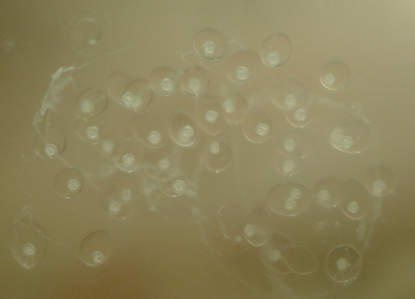 A photo of toad eggs sent to me by Richard and Debi in April of 2003. See my toad page for more information. 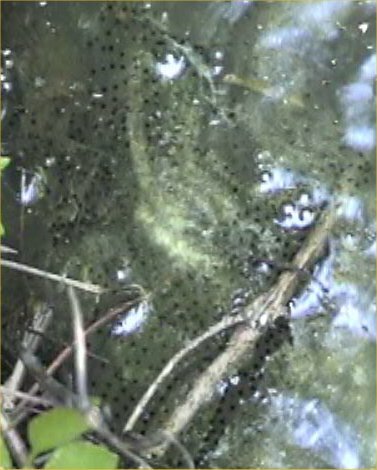 Green frog eggs in my 50 gallon lotus tub on 5/29/04. See my section on green frogs. 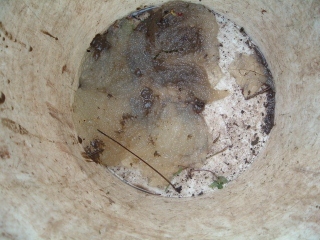 Tree frog eggs sent to me by Linda on 7/7/04. 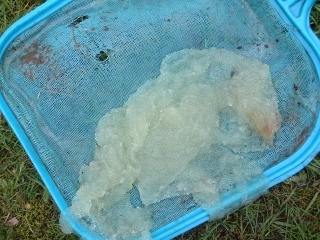 An expert says they are green frog or bullfrog eggs. Yet, when Linda sent photos of the resultant baby frogs, they were definitely some kind of tree frog. They were all stuck to the side of the little pool she put them in. So, there is some confusion but the eggs and froglets definitely look like the tree frogs I have seen! 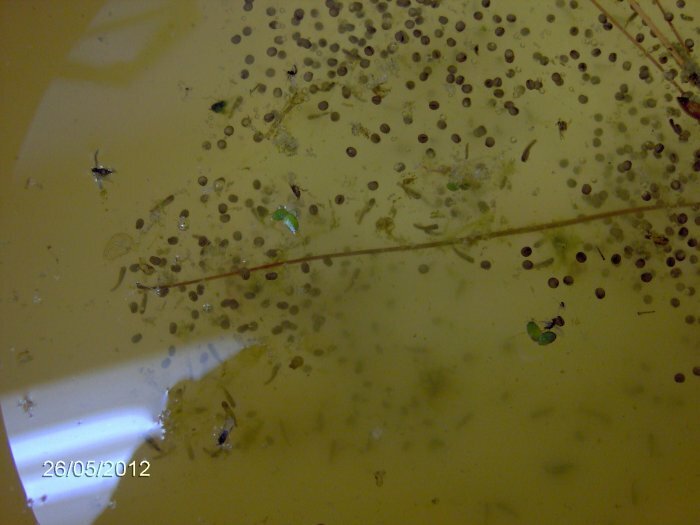 Here is a photo of a batch of Hylid eggs that the expert sent me. She says they are probably cricket frog eggs. On 3/11/07, Amber sent these photos to me for identification. 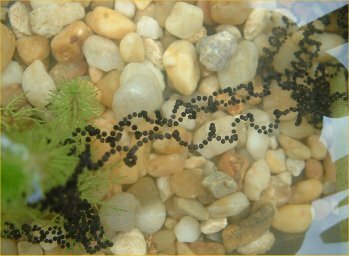 They are salamander eggs laid in her pond in Georgia. 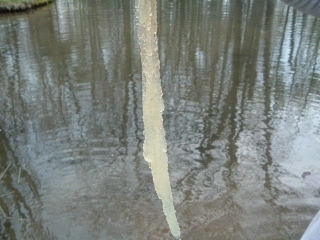 Three globs were resting on a shelf a foot under the water that they found when they cleaned the pond. One of the four photos is shown above; here are three more. Alan sent this e-mail in regards to the above photos on 4/10/07. I agreed with him and was aware of what he says. 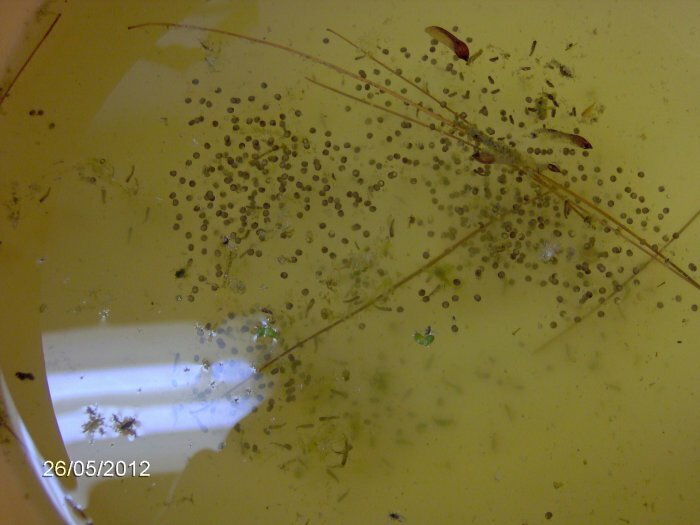 "On your Pond Egg Identification Page you show a salamander egg mass that you received from Amber and dated 3/11/07. This is almost undoubtedly an egg mass of the Spotted Salamander ( Ambystoma maculatum ) for two reasons. First, the size and shape of the egg mass are pretty characteristic; also the time of year is just right for their breeding. This is a very attractive and not uncommon salamander but it is rarely seen during 99% of the year because it is active at night and spends the rest of its time in a burrow. But on the first warm spring night when there is a rain the spotteds gather together in hundreds at pools and mate and lay eggs. The pools are usually temporary pools that do not have fish." 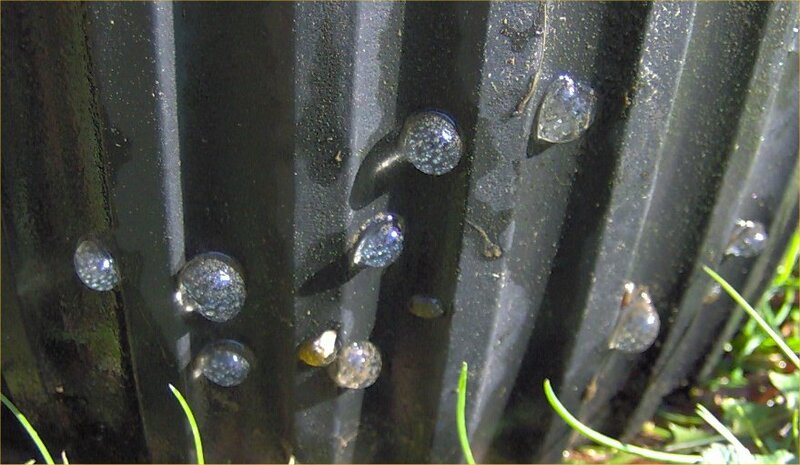 Sarah sent this close up photo of some pond snail eggs in her aquarium on 2/25/07. You can see the snail-shaped babies inside just starting to develop. Snail eggs on another two gallon pot. 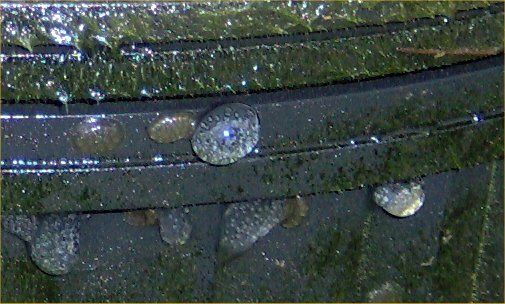 Snail eggs on a two gallon Lerio pot; they are black ramshorn snails. Go to my salamander page for additional photos of salamander eggs. "They're bubbles. As the pond warms, the algae start to grow more, and the bacteria in the pond start to degrade the debris in the pond more. So, on surfaces with algae and/or bacteria (basically any surface), bubbles will form. Algae produce oxygen during the day and carbon dioxide at night. I get those bubbles all in my marine tanks during the day from algal photosynthesis and sometimes in my ponds in the spring. 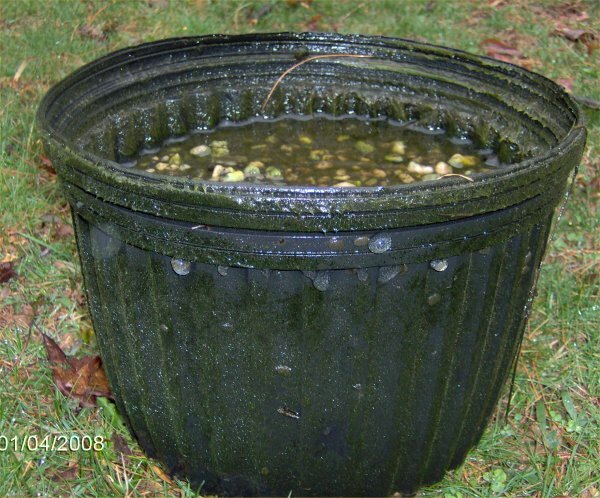 Any organic material in the pond will be attacked and digested by enzymes and bacteria. Anaerobic bacteria live where oxygen levels are low and produce hydrogen sulfide and methane gases as by-products. The first smells like rotten eggs while methane is odorless. Both will cause bubbles to form and both are toxic at high enough levels. For this reason, it's important to keep a pond free of a lot of organic waste (dead plants and animals) and well oxygenated even in the winter with air stones or other water movement such as a waterfall if the setup and climate allows. Anyway, the bubbles are going to be from a combination of photosynthesis and bacterial processes....Touch the bubbles, and they'll vanish. If you don't already have aeration in the pond, I suggest adding it. That should reduce the bubbles which are simply gas pockets where algae and/or bacteria have produced enough gas to cause a bubble which is in equilibrium with the water. 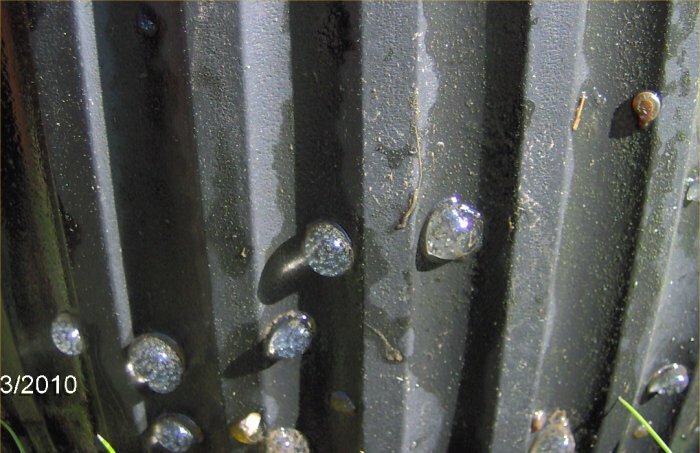 The gas in the bubbles may include oxygen, carbon dioxide, methane, and/or hydrogen sulfide. The bubbles eventually break or float to the surface." 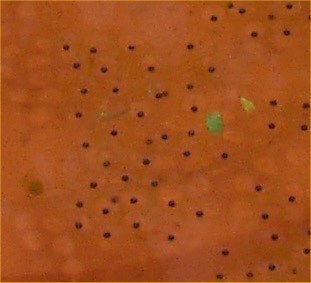 Charles sent these photos on 5/5/12 of eggs for identification. They are perch eggs, probably yellow perch. See the bottom of my insect page for information and photos of some eggs that I could not readily identify. They are probably caddisfly eggs. 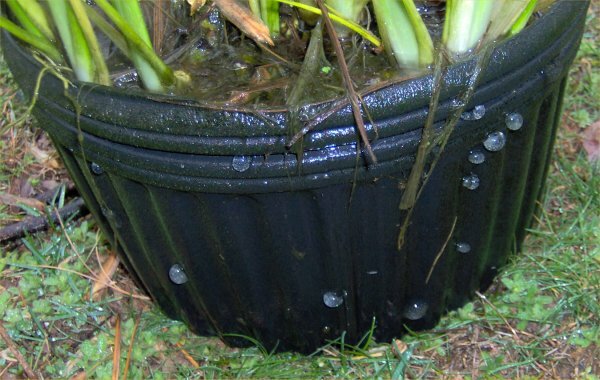 If you have a watergarden or pond, you will be forever finding various eggs in and around the pond. Some are small; some are large. Some are in clumps; some are laid singly. Some are colored; some are plain. But they all will eventually result in the birth of a new generation of something. But what? Perhaps the guide below will narrow things down for you. If you cannot find out what eggs you have from my guide, then send me the answers to these questions with your query. It would help to have a small jpg photo (in focus and with something to tell the relative size of the eggs) if you contact me. A few non-egg things are often mistaken for eggs. These include bubbles (normally bunched in a stream around algae), bryozoans (which are colonial animals), waterlily seeds (which are in a gelatinous slimy pouch), and other plant seeds. 1. Are the eggs in a ball/glob? 2. Do the eggs float or sink? 3. What are the dimensions of the eggs (diameter if circular, please include the units)? 4. Are the eggs attached or not and to what (plant, rock, sticks, each other?). 5. Are the eggs scattered or in a clump? 6. Are the eggs all together or all over the place? 7. Are the eggs stuck to a solid surface (rock, leaf) or just loose amongst plants? 8. Do you have snails, turtles, goldfish, koi, other fish, frogs, toads, salamanders, etc. 9. Do the eggs contain jelly? 10. Are the eggs in or out of the water? 11. What color are the eggs? 12. What does the inside of the eggs look like (clear, eyes, no eyes, movement, etc.)? For links to the egg-laying pond animals on my web pages, go to my pond index. This guide is for the Eastern United States but may help narrow things down for residents of other areas as well. You can click on the highlighted animals for pages with information on them. This guide assumes that you know that what you are looking at is actually an egg and not something else (plant, fungus, inert, etc.). You may also be required to have heard noises in order to find the solution. If you have heard no noises, when there is a question about having heard something, you will need to try all the options for further questions to narrow things down. For photos (and information and sometimes calls for frogs) of species of wild animals native to your area if you live in the USA, try enature.com where you can enter in your zip code to find animals in your specific area. 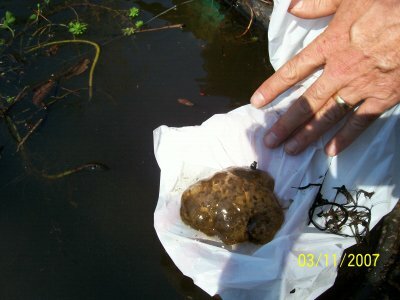 In general, frog eggs float and are a circular mass; salamander eggs sink, are huge masses with lots of jelly, and may or may not be attached to plants or sticks; and toad eggs are midwater attached to plants and sticks and are laid in a string. 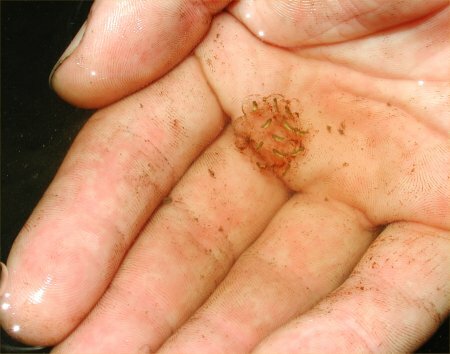 While amphibian eggs are found in masses, fish eggs and other eggs may be found individually or in small groups. 1. Is the egg mass above or below water? If on land, go to Number 2. If in the water, go to Number 9. 2. Is the mass large, kind of dry, and pink or yellow? If so, then go to Number 3. If not, go to Number 4. 3. Congratulations! You most surely have apple snail eggs. Their eggs are laid above water on plants or rocks. 4. Are the eggs small, hard, and black and on the rocks? If so, go to Number 5. If not, go to Number 6. 5. I have these hard black dots all around my rocks. I believe they are not eggs but the overwintering hibernaculums of the tiny red mites that cover the rocks in the summer. I am not positive though! 6. Are the eggs very tiny, black, and laid on the plants? If so, go to Number 7. If not, go to Number 8. 7. These are most likely insect eggs. There are many possibilities so to narrow it down further requires an entomologist specializing in this area. 8. Are the eggs large and white and on the ground or buried in the dirt or sand? If so, go to Number 39. If not, go to Number 37. 9. Are the eggs floating and not attached to anything or only loosely attached? If so (not attached), go to Number 10. If not (they are attached or sink), go to Number 25. 10. Is the egg mass smaller than two inches across? If so, go to Number 11. If not, go to Number 43. 11. Is it late winter into early spring? If so, go to Number 12. If not, go to Number 17. 12. Have you heard cricket-like chirping recently? If so, go to Number 13. If not, go to Number 14. 13. These may be the eggs of the spring peeper. They are only a inch or so across. 14. Have you heard duck-like quacking recently? If so, go to Number 15. If not, go to Number 16. 15. You must have eggs of the wood frog. Their circular egg masses are 2-4 inches across. The tadpoles are very small. 16. The eggs probably belong to another small frog (or you missed the others calling) such as the cricket frog, chorus frog, or ones native to your area. 17. Is it late spring, and you have heard loud (some would say irritating) noises from the pond at night? If so, go to Number 18. If not, go to Number 19. 18. These may be the eggs of the gray tree frog. Their circular egg masses are 2-3 inches across. 19. I am not sure which species these eggs belong to but it is probably frog eggs. 20. Have you heard noises like the twang of a banjo string? If so, go to Number 21. If not, go to Number 22. 21. 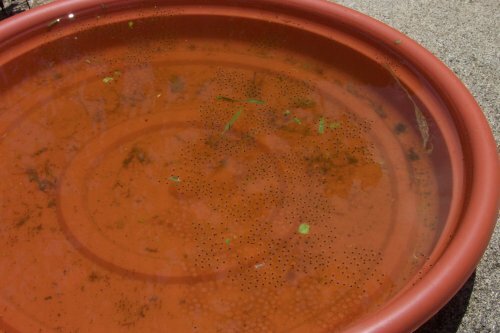 You may have green frog eggs. 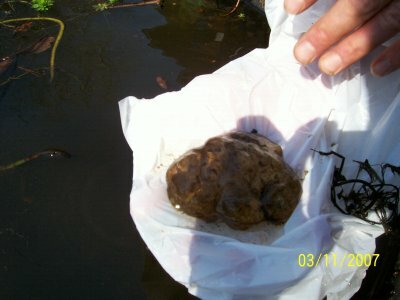 Their egg masses are usually circular and about 4-6 inches across. 22. Does a loud "blah, blah" come from the pond, mostly after dark? If so, go to Number 23. If not, go to Number 24. 23. Sounds like you have bullfrogs and perhaps bullfrog eggs. 24. Is the egg mass round like a ball (not flattened) and over about three to four inches in diameter? If so, go to Number 41. If not, go to Number 42. 25. Are the eggs laid in a long string with black dots along the edge and draped around the vegetation in the pond in spring? If so, go to Number 26. If not, go to Number 27. 26. Congratulations! You have toad eggs. See my toad page for lots more information. 27. 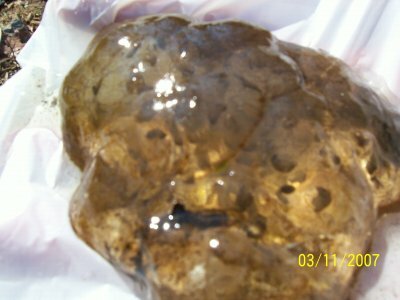 Are the eggs in a large jelly-like blob mass that sinks to the bottom or is among plants and found in late winter or early spring? If so, go to Number 28. If not, go to Number 29. 28. Sounds like you were lucky enough to be visited by salamanders (or rarely newts)! See my page on salamanders for more information. Salamander eggs will stay around for a while after they hatch but start to decompose and turn white and dirty. 29. Are the eggs in a jelly-like blob (the jelly extends over all the eggs, not just a single egg) and attached to a plant, ornament, etc.? If so, go to Number 30. If not, go to Number 31. 30. Are the eggs relatively small, typically half an inch or less but certainly less than an inch long? If so, go to Number 40. If not, go to Number 41. 31. Are the eggs individually strewn around the substrate, plants, etc.? They may stick to what they land on or each other but they are not laid in a single clump. If so, go to Number 32. If not, go to Number 33. 32. These are probably fish eggs. It is impossible to say if they are from goldfish, koi, orfe, or other egg-laying fish. You should know which species are in your pond and thus narrow it down. 33. Are the eggs small, dark, and stuck on top of or under plant leaves mostly (may or may not contain jelly)? If so, go to Number 34. If not, go to Number 35. 34. These may be insect eggs. They could be from dragonflies, damselflies, leaf-mining midges, caddisflies, mayflies, stoneflies, or any other of thousands of species of insects who have aquatic larvae. See my insect index for more information on these guys. 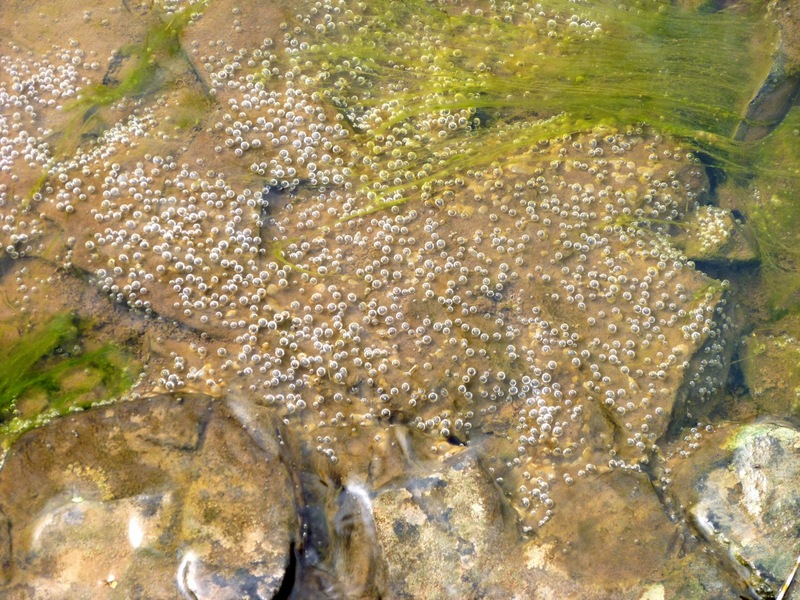 Also, at least one person who e-mailed me had their rosy red minnows lay eggs underneath a lily pad. They normally use solid surfaces like rocks, clay pots, caves, folds in the liner, etc. 35. Are the eggs clear (or contain fish eggs later in development), laid next to each other under water, and attached to a hard surface or plant? If so, go to Number 36. If not, go to Number 37. 36. Do you have fathead or rosy red minnows? If so, go to Number 38. If not, go to Number 37. 37. Ok, you have stumped me! I have no idea! 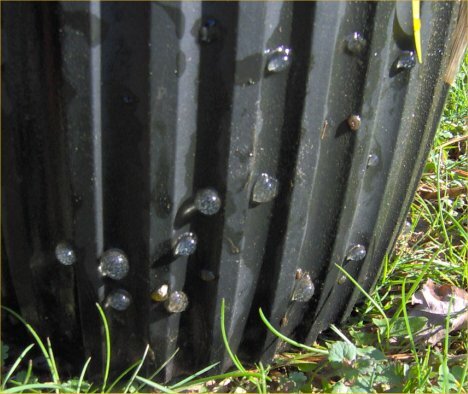 One thing to note is that if your pond water level has receded lately, it may have left behind some snail or fish eggs that were originally in the water but now are not. 38. Congratulations! Your minnows have laid eggs. 39. If the eggs are round, a turtle may have laid eggs near your pond. If you have turtles, then you know who left them. If not, then a box turtle may have dug a nest near the pond as one did at my pond. If the eggs are not round but oblong, they may be snake eggs. Note: If you live in alligator country, those could even be gator eggs if the nest is huge. Large white eggs buried in the ground are almost always reptilian. 40. Are the eggs in a round mass? If so, go to Number 44. If not, go to Number 45. Sounds like snail eggs to me. Check out my snail page to try to narrow it down. Note that some insect eggs contain small amounts of jelly but eggs are usually single but may be close enough to appear to be in a mass. 41. If the "eggs" are large masses under water and attached to something and seem to be devoid of the typical embryos inside, they may in fact not be eggs at all. They might be bryozoans or moss animals which are colonies of single-celled animals. Bryozoan balls may also be free floating, like volleyballs just floating around. Go to this section for more information and photos to compare. 42. Are the eggs in a long, white strip? If so, they may be perch eggs. 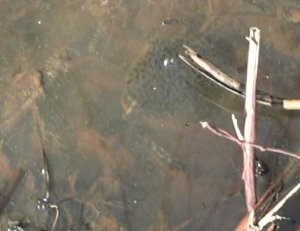 If not, the eggs could belong to leopard frogs, pickerel frogs, or another large frog. The eggs may belong to another large species of frog with which I am not familiar or that is native to where you live but not near me. 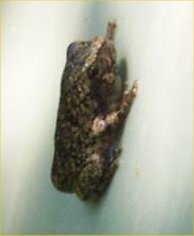 For a photo and sound guide to some of the frogs specific to your area if you live in the US, go to enature.com to enter your zip code into their guide. For a list of web sites with frog calls and photos, go to my section on frog links. 43. Have you heard duck-like quacking recently, and it is early spring? If so, go to Number 15. If not, go to Number 20. 44. Sounds like snail eggs to me. Check out my snail page to try to narrow it down. Note that some insect eggs contain small amounts of jelly but eggs are usually single but may be close enough to appear to be in a mass. 45. Are there many eggs (often colored green with algae) in a donut-shaped circle of jelly? If so, go to Number 46. If not, go to Number 47? 46. They may be caddisfly eggs. See the bottom of my insect page for photos and more information. 47. I am stumped. Send me a photo.